I started this one right after I finished the first version in the playground palette. I cut all the squares, and then I must have gotten distracted by other things, because it sat for a while, until one day when I found myself (Morgan) vacuuming around it, and figured it was time to sew those squares together. Once again, this is just a simple patchwork squares quilt, using squares that are 3 1/2″. I like the smaller sized squares for these fabrics, since the prints are a smaller scale as well. 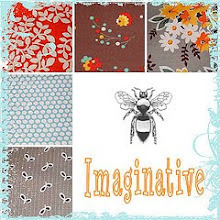 Little Folks voile fabrics purchased from Hawthorne Threads. Dobby dots and voile solids purchased from Fabricworm. This entry was posted in Posts about Quilts and tagged anna maria horner, handmade, little folks, patchwork, patchwork squares, quilt, quilting, voile. Bookmark the permalink. 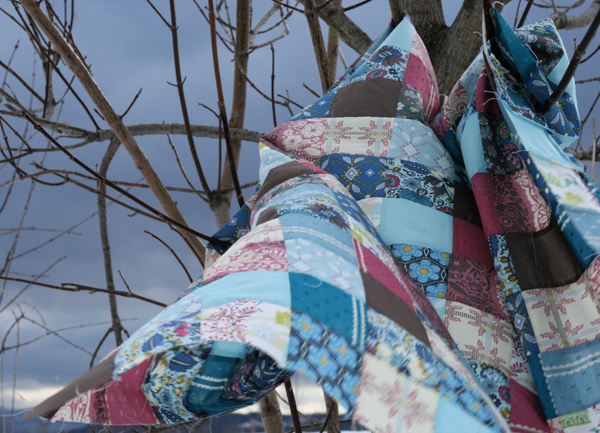 and I present to you… the flying farfalle quilt! I love this color combination. Maybe this is a silly question, but it seems like you are constantly making quilts (I am jealous). How long do you spend on each quilt? curved pins are the best. i accidentally purchased them a couple years ago and what a great accident they were! The ‘simpleness’ lets the material come out so well! Beautiful quilt! Another beauty! Would you mind posting about your basting process? I find that step to be the most daunting (especially living in a 1BR apartment)… Thanks for your wonderful blog! The quilt is beautiful!! I love that you have it sitting in a bare tree with a sky that matches perfectly. Okay what an amazing way to take a picture! I’m always looking for different ways to display my quilts when they are finished! This one is going in the book, and the moonlight matches so well! 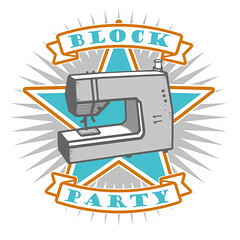 PS the quilt is great too! Love the colours! The backdrop is just perfect for the quilt 🙂 So glad you’re using curved pins now hehe I’ve got a large jar of them and I definitely couldn’t quilt without them! Once again I am in awe of not only the quilt, but the beautiful backdrop. Wow, Ashley, great photographs! It was so nice meeting you at the LAMQG meeting on Monday. 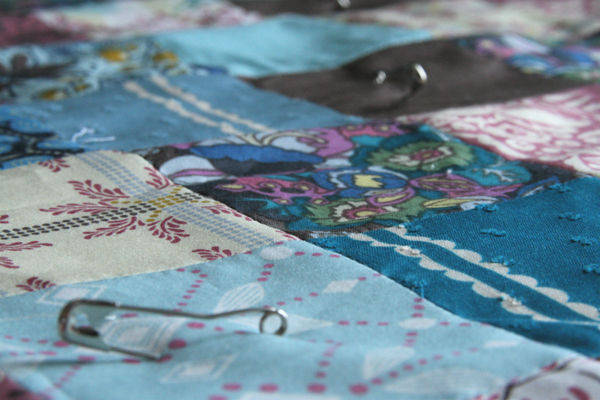 Thanks so much for your comment about my quilt…it means so much coming from you. I just love the way you put colors together and emphasize some with skinny strips of solids. You are so talented and inspiring! BEAUTIFUL! What a pretty palette of colors! I love this so much, it is beautiful. I usually like to look at your quilts for inspiration, but this one I think I am just going to down right copy! I have completely become obsessed with the Little Folks line. I wasn’t that excited about it until I saw it here, and now I want quilts and dresses and tunic . . . everything made from that line. Stop it!!! I am just kidding. Your work is truly wonderful!!! Everything I see on your blog I want to attempt. Great pictures! Do you ever wonder if the neighbors know what you’re really doing? very nice,pretty cool pins too. I will never get sick of this fabric line!!! LOVE this color palette, and what a gorgeous quilt top! Wow! That wasn’t my favorite color palette but seeing it together like that, love it! That top photograph is incredible. I love it so much I refuse to call it a photo. It’s definitely a photograph. The photographs are amazing. I like the quilt, but I am not sure how much I would like it without having seen it in the photos. I do love this quilt and these colors together! So soft looking and calm feeling. You didn’t have quilting pins with the bend in the middle? They are a staple, so it’s good to see you have some now! Makes the basting process so much easier on your fingers! just beautiful! and i love my curved safety pins too…enjoy them! Oh I can sleep now. Ashley is not poking herself and risking losing blood on one of her lovely quilt tops. I should state here in public that I really am not paying Ashley to sew with my fabric, but it is certainly a joy to watch! Honestly, this is getting ridiculous…..I see the quilts you make and the fabric you use and I practically go right from your blog to the online store, and voila (no pun intended..voile/voila?) ….it’s on my doorstep. Unfortunately for me, I gave up “indiscriminate” fabric-buying, which is what this would fall under. But when Easter has come and gone…my fingers will be clicking away to help the the voile land safely on my doorstep! Really, super gorgeous quilts you are making with this stuff. Are you selling this one? I hope so, because I want want want it! I could make it but I’m not sure when that would ever happen. So please let me know 🙂 Its so beautiful! I love this one!! The Photo is so beautiful! 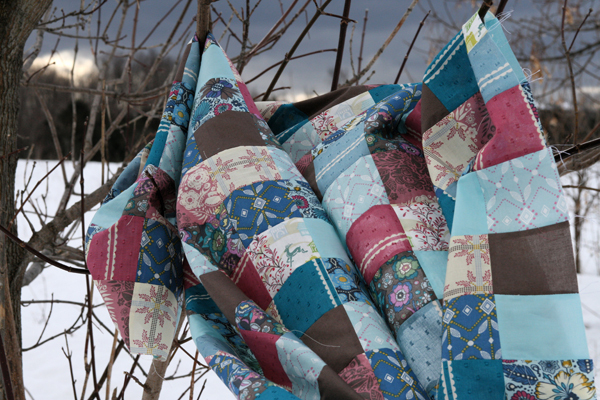 That grey sky behind the quilt top Stunning!! If I could only ever have one group of fabrics to work with…I would choose those exact AMH ones you used! Really, what a gorgeous quilt! wonderful! I fall in love to this fabrics! That is a beautiful quilt. I love the color combo. This quilt is made even more lovely by the backdrop. Wonderful photography! This isn’t about the quilt, it’s a comment to wish you and Morgan a Happy 1st Anniversary! Hope you have a beautiful day. We are thinking of you both! Absolutely gorgeous!!! I love it…the colors flow really well together and even though its not your typical colors i like it. I would also like to wish you and Morgan a HAPPY ONE YEAR ANNIVERSARY!!! Hope your having a great vacation.